I like really niche blogs. 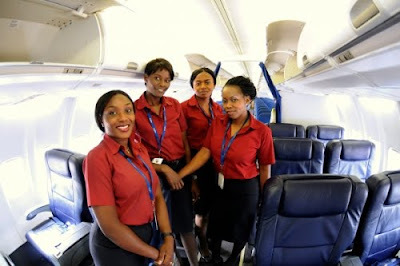 This one is devoted entirely to Arik Air. The chap behind it says he doesn't work for Arik, however it does gush a little. That said, I have heard people gush about Arik's business class flights to London. These days, when BA cabin staff are looking so underpaid and malnourished, maybe it'd be worth a try..
Nice one Arik, its good to see a Nigerian business that works. I hope they keep it up. How is naija eagles former virgin this days? People should pay attention to what really counts ie AIR SAFETY in the country. I would rather a properly managed airports authority than some glitzy new airline operating in unsafe skies. Knowing Nigeria, not a lot will be done about this. Until next time when people may well die, and who knows with the indifference to loss of life that may still not be enough. Concentrate on the basics, like air safety, back up generators that are supposed to work, fire engines with water and staff that are equipped and motivated to do the job, would be a whole lot more noteworthy than the latest developments of Arik. Are both mutually-exclusive? Sometimes, I just don't get some Nigerians. Jeremy, there's no question that guy's a company shill. No question. Nobody loves Arik that much. I have my own Arik story, on a flight from Abuja directly into Port Harcourt, I got put on a plane with NO air-conditioning. The hostesses were using the safety guide to fan themselves while consoling us with the fact that it would get cooler once we took off. One consolation was the flight DID take off. On a previous occasion, the same flight was cancelled and the passengers moved to the regular flight stopping at PH international. Reason given - they didn't have enough passengers for that flight. No compensation was given or offered, despite the fact that the cancelled flight cost more than the regular one. Maybe I should start my own blog, F**kArik.com. And still (even despite those occasional hiccups) Arik is the best airline that I have flown in my couple of years in Nigeria (though Aero used to be quite good). Btw, I am spending the holiday season back in the US, where I sat on a plane on the runway unfed for approximately 6 hours.